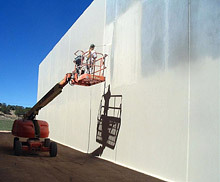 PRM is a powdered polymer reinforced adhesive and underlayment for use with acrylic finish coatings. PRM provides a strong bonding surface on several different types of foam as well as concrete substrates. PRM is used as a base coat, leveling and reinforcement for the Waterway Drainable Stucco assembly, EIFS and direct-applied systems, as well as an adhesive for some foam system applications. PRM is usually applied with stainless steel masonry trowels at a nominal 1/16 -1/8 inch. It can also be spray applied with proper equipment onto the substrate, then troweled to smooth out the surface. Over approved foam substrates and the Waterway Drainable Stucco Assembly, PRM should be used in conjunction with fiberglass reinforcing mesh. 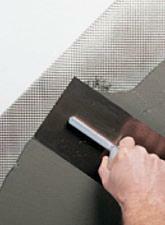 Apply to the backside of approved insulation board with a 3/8 inch notched trowel. Apply ribbons over the entire surface running parallel to the short dimension of the insulation. Immediately adhere insulation to properly prepared substrate using firm pressure across the entire surface making positive contact. Place the board on the substrate about 2-3 inches from desired finished location and slide into place to ensure positive contact. Stagger all seams and joints, avoid gaps in foam surface. Apply with stainless steel masonry trowels at a nominal 1/8 inch. PRM can also be spray applied with proper equipment, then troweled to smooth out the surface. 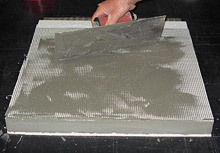 Immediately embed Fiberglass Reinforcing Mesh into wet base coat, troweling from the center to the edges. Overlap mesh 2 inches on all ends and edges. Avoid wrinkles and smooth out wet base coat to a minimum 1/16 inch thickness over mesh such that no mesh pattern is visible. Apply an additional layer of base coat if needed to achieve minimum thickness and provide a smooth surface prior to finish coat applications. Light sanding of the PRM is acceptable to achieve a level substrate for the finish coat; usually this is best performed the day after initial application. Apply mixed PRM in an adequate thickness to smooth and flush out imperfections in the substrate below. Allow to dry completely (24 hours minimum) prior to Stuc-O-Flex Finish Coat application. Stuc-O-Base is a wet-mix concentrate that when mixed 1:1 by weight with Portland Cement is used as an excellent adhesive and underlayment for use with acrylic finish coatings. Stuc-O-Base uses a high quality acrylic polymer that provides a strong bonding surface on several different types of foam as well as concrete substrates, creating a strong level platform for finish coat applications. Stuc-O-Base should be mixed 1:1 by weight (equal parts) with fresh, dry Portland Cement type I or II. Product should be allowed to sit for 10 minutes, then remixed & used immediately. Avoid retempering after mixing the Stuc-O-Base. Stuc-O-Base is usually applied with stainless steel masonry trowels at a nominal 1/16 -1/8 inch. It can also be spray applied with proper equipment onto the substrate, then troweled to smooth out the surface. Over approved foam substrates and the Waterway Drainable Stucco Assembly, Stuc-O-Base should be used in conjunction with fiberglass reinforcing mesh. Apply with stainless steel masonry trowels at a nominal 1/8 inch. Stuc-O-Base can also be spray applied with proper equipment, then troweled to smooth out the surface. Immediately embed Fiberglass Reinforcing Mesh into wet base coat, troweling from the center to the edges. Overlap mesh 2 inches on all ends and edges. Avoid wrinkles and smooth out wet base coat to a minimum 1/16 inch thickness over mesh such that no mesh pattern is visible. Apply an additional layer of base coat if needed to achieve minimum thickness and provide a smooth surface prior to finish coat applications. Light sanding of the Stuc-O-Base is acceptable to achieve a level substrate for the finish coat; usually this is best performed the day after initial application. Apply mixed Stuc-O-Base in an adequate thickness to smooth and flush out imperfections in the substrate below. Allow to dry completely (24 hours minimum) prior to Stuc-O-Flex Finish Coat application. Primeseal is a specialized primer / sealer designed to block staining and bleed-through caused by tannic acid, sheathing laminates and other substrate contaminates. Primeseal is also an excellent sealer for traditional cement stucco ensuring a uniform porosity and to retarding moisture or vapor penetration. Primeseal is applied to various substrates including polymer modified base-coat prior to Stuc-O-Flex finish applications. Offers uniform porosity of the substrate and extends working time of the finish coat, enhances uniformity in finished appearance. Substrate must be clean, dry, above freezing and free from all loose or foreign materials prior to application, including rust, mildew, dust, dirt, form breaker and oils. Remove all loose surface materials using high pressure wash (>3000 psi), sandblast or mechanical wire brush. 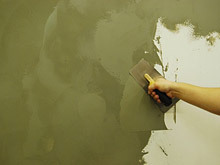 Primeseal may be applied by brush, roller, or spray equipment. Screen prior to spray application. Apply Primeseal to a uniform thickness free of pin-holes and voids.